Ginger juice is a simple beverage made from fresh ginger (Zingiber officinale) and water. The easy-to-make juice allows drinkers to take advantage of the health advantages of ginger without cooking or preparing a meal from scratch. While the drink is much healthier than its distant cousin ginger ale, only some ginger juice benefits are supported by strong scientific evidence. 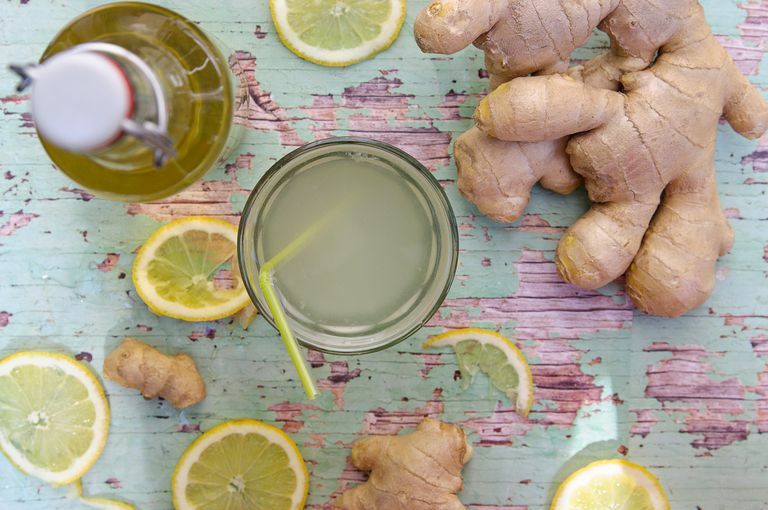 There are no carbohydrates in this drink when you make the most simple ginger juice recipe with water and fresh ginger juice. However, the carb count and nutrition facts change if you add sweetener to your recipe. Some variations call for honey, sugar, or stevia. If you add a non-nutritive sweetener, such as Nutrasweet, Equal, or a sweetener made with stevia, you will still consume zero carbs in ginger juice. But if you add honey, you'll consume about 17 grams of carbohydrate and 64 calories for every tablespoon that you add. If you add table sugar, you'll consume 16 extra calories and 4.2 carbohydrates for every teaspoon that you add. The estimated glycemic load of ginger is 2, however, that number is based on consumption of whole ginger. Drinking ginger juice is not likely to have any effect on your blood sugar unless you add a caloric sweetener. There is no fat in any ginger juice recipe variation. The most common additions to the basic drink ingredients include foods that are naturally fat-free, such as lemon or coconut water. There is no protein in ginger juice. Whole fresh ginger contributes small amounts of certain vitamins and minerals. For example, a quarter cup of ginger slices contributes 1.2 mg of vitamin C. However, that small amount is only 2 percent of your total recommended daily intake if you consume a 2,000 calorie per day diet. One quarter cup of ginger also provides 99.6 mg or 3 percent of your daily allowance of potassium, 10.3 mg or 3 percent of your daily intake of magnesium, 2 percent of your daily intake of vitamin B6 and one percent of your daily intake of niacin and folate. But when you drink ginger juice—instead of whole ginger—you are not likely to gain these micronutrient benefits except in very trace amounts. The health benefits of ginger are widely promoted. For that reason, many people consume ginger tea or add ginger to their favorite food recipes. Now, ginger juice has become popular so that it is easier for consumers to gain these purported health benefits. But not all of the claims are supported by strong science. Ginger is often used to calm stomach discomfort, reduce nausea and vomiting, relieve indigestion, treat diarrhea, stimulate the appetite, and even to reduce symptoms of morning sickness or chemotherapy. Scientists are not sure exactly how ginger provides these benefits, but they do know that compounds in ginger increase production of digestive juices and saliva. Scientists note that human studies into these gastrointestinal benefits are lacking and more research needs to be performed. Ginger is also known to help thin the blood by preventing blood platelets from sticking together. But while this benefit may help some, it can be dangerous for others. For example, people who are about to undergo surgery are generally advised to avoid ginger and other foods that thin the blood. Lab and animal studies have also suggested that ginger may help reduce inflammation, reduce your risk for cancer, assist in the management of drug withdrawal, protect against Alzheimer’s disease, and reduce blood sugar. There is also some evidence that ginger may help reduce pain during menstruation and reduce lower back and joint pain. Studies (those done in labs, on animals, and on humans) are generally performed using fresh ginger. It is unclear whether drinking ginger juice can provide any of the benefits that consuming sliced, shredded, or whole ginger can provide. How should I select the best ginger for ginger juice? Look for ginger in the produce section of your grocery store. The thick brown roots should have a strong, spicy smell and should be firm in your hand. Avoid ginger that has any soft spots. The skin on the root should be clean, tannish-brown, and relatively thin. Some food experts suggest that you should be able to nick the skin with your fingernail. Once you get the ginger home, use as much as you need and store the rest in an air-tight, resealable bag in your refrigerator. Fresh ginger will last about one month when stored properly. What is the best way to peel ginger and prepare it for a ginger juice recipe? Each fresh root will need to have the skin removed before using it in a ginger juice recipe. Removing the skin can be tricky so this is a step that many cooks struggle with. Chefs who cook with ginger often recommend using the back of a metal spoon and scraping it against the root as the best approach. Once the ginger is peeled, ginger is usually chopped or sliced for use in the juice recipe. After chopping, ginger is usually added to a blender with the other ingredients. If you make a batch of ginger juice at home, it should be good for about two weeks if stored in the refrigerator. However, the ingredients you add to your recipe may change the expiration date of your batch. If you buy commercially prepared ginger juice, the bottle will provide a "best by" date. There are different ginger juice recipes and variations, but most follow the same basic steps. Begin with freshly grated ginger. Peel and loosely chop about one cup. Add to a blender with two cups of water. Add honey, lemon, table sugar or a non-nutritive sweetener such as Equal. Strain to remove root pieces. Store the ginger juice in a large jar in your refrigerator. Pour over ice and add mint or lemon to serve. Some ginger juice recipes suggest that you put the drink in the sun for 1-3 days for a stronger flavor. While ginger in many forms may provide some health benefits, some people should be cautious about including it in their diets. For example, even though there are claims that ginger can help pregnant women avoid morning sickness, health experts advise that pregnant and lactating women should avoid ginger supplements. Additionally, medical sources say that patients should avoid ginger for two weeks before surgery and then again after surgery because of its blood-thinning properties. Ginger supplements should also be avoided in patients with bleeding disorders. Lastly, sources say that ginger is not always safe for those with gallstones. People taking blood thinners, NSAIDs (nonsteroidal anti-inflammatory drugs), tacrolimus, insulin, or any medication to lower blood glucose should avoid ginger supplements and speak to their doctor before including ginger in their diet. Ginger. Herbal Safety. University of Texas, El Paso/Austin Cooperative Pharmacy Program & Paso del Norte Health Foundation. Ginger. Memorial Sloan Kettering Cancer Center. Integrative Medicine. About Herbs, Botanicals, and Other Products. June 2016. Ginger. National Institutes of Health. National Center for Complimentary and Integrative Health. 2016. Ginger.Therapeutic Research Center Natural Medicines Database. March 2018.